No one fights for what they do not believe. We all fight for what we want from life, whether directly or indirectly. Living a life dedicated to God is a battle against the systems of this world. Have you noticed, everything around us is designed to keep our focus on self pleasure? We all struggle with the flesh daily. Its the sinful garment we wear on this side of eternity. Psalm 51:5 states “Surely I was sinful at birth, sinful from the time my mother conceived me”, yes, this is true BUT we are no longer slaves to sin, halleluyah! We know our old nature was crucified with Christ (Romans 6:6), the body ruled by sin has been done away with, Praise God. The power of redemption makes us sensitive to sin. As a believer, spirit filled and tongue speaking, we know there is a clear dimercation between the flesh and the spirit. When the ways of the flesh wants to take over, the spirit within us speaks, our conscience rises, and we receive strength to overcome sin. However, we know this is not always the case; there are times when the sinful nature raises his head and we are late in responding. After such instances, we are quick to repent, confess our sins and look to spiritual cleansing by the Holy Spirit. 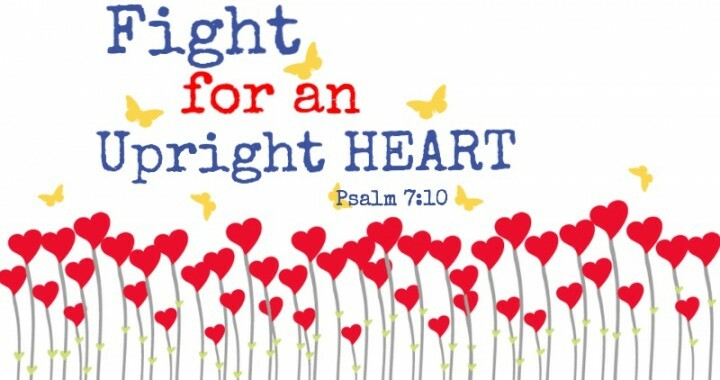 We must constantly fight for an upright heart. An upright heart is free of guilt, dishonest deeds and thoughts of vanity. Sin is lawlessness (1 John 3:4), whenever we behave contrary to the word and precepts of God, we walk into sin. Fighting for an upright heart is to be proactive in our desire to please God. Be deliberate to enjoy the benefits of maintaining an upright heart. In Jesus name, I receive peace, confidence and joy in the Holy Spirit, the anchors of the upright heart. Amen.